Um, that is a lot of bags. It’s the time of year when I finally admit at work that I am a slob and a hoarder, then throw everything away. Out sink/counter is actually an old bathroom vanity. 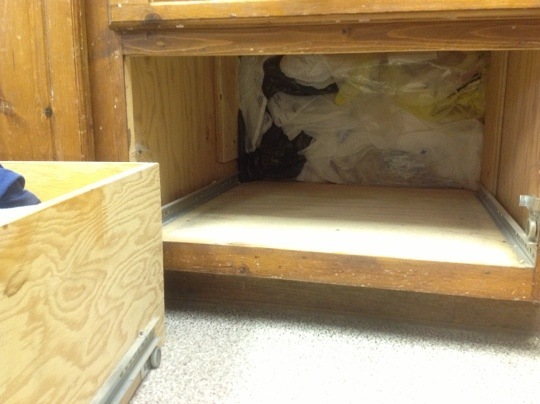 In the right-hand middle drawer we keep plastic bags for ……well, whatever we might need plastic bags for. Over the year, we just kept stuffing bags in that middle drawer. Yesterday I pulled them all out – both grocery and ziplock – and whittled them down to a manageable number. Then I went through the other drawers and tidied them up, too. When it was time to close the right-hand bottom drawer, it wouldn’t shut all the way. It’s like a secret desk compartment. I wonder if Nicholas Cage would be able to puzzle out the meaning of all those hidden bags and they would lead him to a lost national treasure. HA! It’s The Attack of the Plastic Bags! You think you’ve gotten rid of them, but they’ve multiplied. Run for your lives!